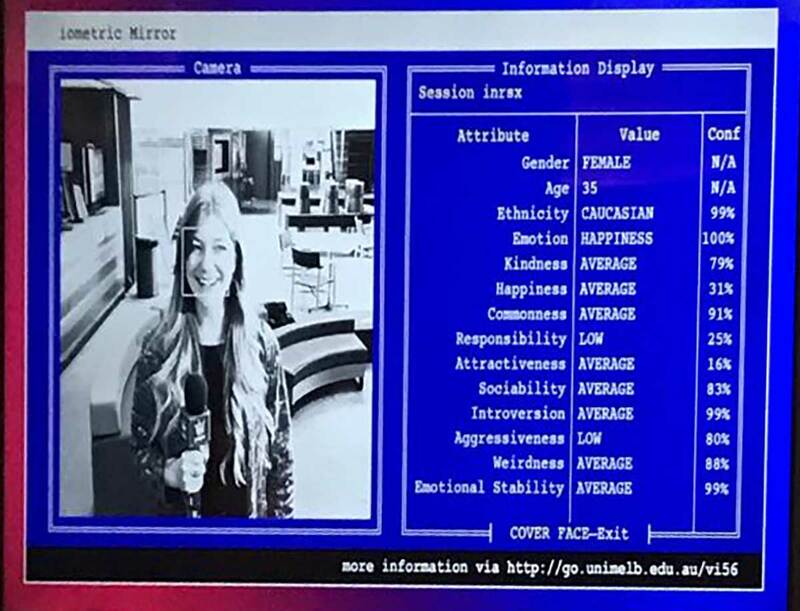 The Biometric Mirror scans people's faces and uses AI to compare their faces against a database of other faces to produce a personality profile of the scanned person. The reports include ratings for the individual's responsibility, happiness, aggression, attractiveness, weirdness, and emotional stability. The project lead is Dr Niels Wouters at the University of Melbourne's Centre for Social Natural User Interfaces. The project was created for the purpose of examining the ethics of such systems, not to commercialize it. Facial recognition is already being used by police departments, most notably in China, which has announced plans to build an overarching surveillance network that is "omnipresent, completely connected, always on and fully controllable". In Australia, legislation to create a national database of faces and other biometric markers is currently before parliament. For the recent Commonwealth Games, Queensland police matched drivers' licence photos with security footage. City of Perth has deployed facial recognition cameras in the Perth CBD to identity what it calls "troublemakers" on a "Black Watchlist" that it controls. Critics say the local government is trying to be a shadow police force. Facebook, already under scrutiny for data-mining practices, has rolled out facial recognition tools that consumer and privacy groups say violates user consent. The technology can be used to remotely identify people without their knowledge. Jo Lauder of ABC (Australia) tried out the system and wrote about it. Her report is shown above.